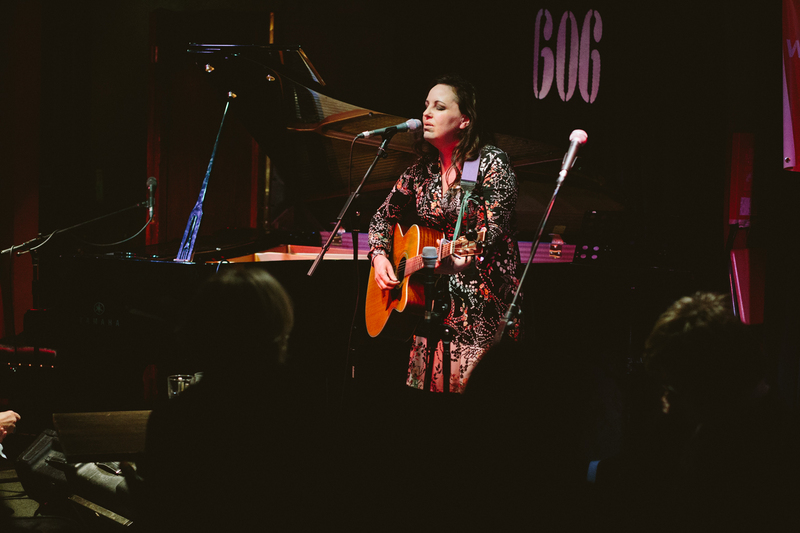 In its almost forty years presenting live music in London, the 606 Club, under the leadership of owner (and musician) Steve Rubie has played host to many a charity night on behalf of an important cause. This benefit was organised by humanitarian campaigners Side by Side Refugees, a non-political grassroots effort to respond to the urgent needs of refugees in Calais and Dunkirk. Jazz vocalist Ian Shaw has been closely involved with this humanitarian crisis for the past year, working with Side By Side (as well as Médecins Sans Frontières & Care4Calais). Ian, who is donating all the proceeds from his single “My Brother” released in December of 2015 to charity, compèred the night. One of Side By Side Refugees co-founders, Katrina Kieffer-Wells (a garden designer & mum from Essex, who along with her friend, Rachel Hattingh Marshall, are the principals behind the organisation) took the mic to describe the work of SBS, which she succinctly summed up as “delivering donations, skills and a friendly smile” to the people in the Calais refugee camps. She spoke affectionately of Ian Shaw, whom she playfully called “her jungle husband” while imploring those present to recognise that “the need is great and the need is now”. Ian Shaw then sat at the piano to play two songs, which poignantly captured the essence of the night: You’ve Got a Friend – turning its lyric, “when you call out my name” into a battle cry – and the bittersweet classic, Here’s to Life, before introducing singer, songwriter (& fellow activist), Sarah Gillespie to the stage. With her intense, almost primal delivery, Sarah is an artist that, once heard, you’ll not easily forget. 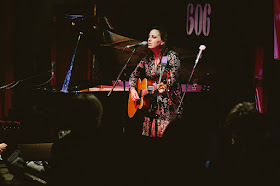 A storyteller with wry lyrics that evoke humanity and heartache in all its raw and despairing magnificence, she’s a powerful force and her songs, which are built upon her fine acoustic guitar work, are an atmospheric, 21st century blend of folk, blues & roots music. 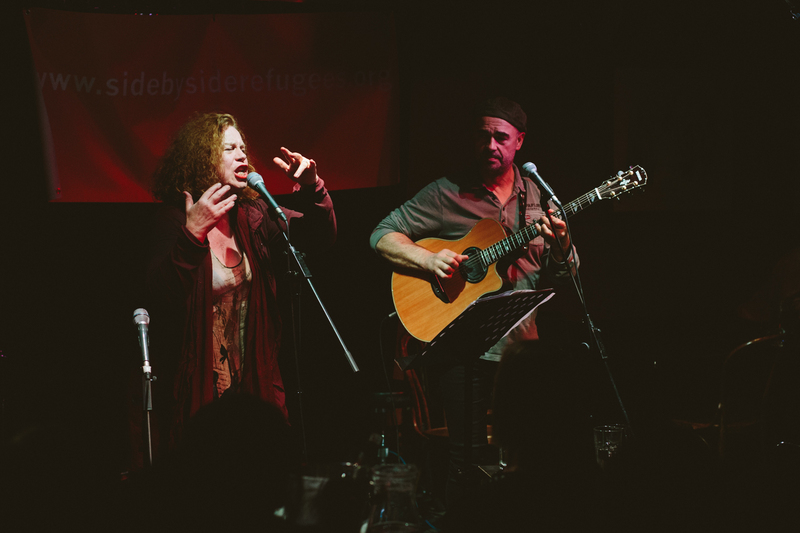 After Sarah’s three-song set (Glory Days - tribute to her mum, Sugar Sugar & Million Moons), Ian came forward to introduce Sarah Jane Morris & Antonio Forcione, as only he could. Ian recalled his discovery of Sarah Jane when she was in The Republic, followed on by the Communards, speaking fondly of her “Victorian knickers and Doc Marten boots”. The chemistry between Sarah and Antonio is something to behold. Alhough their partnership is of relatively recent vintage – they’ve been performing together since 2013 – it clearly inspires and energizes them both. They will, incidentally, be appearing at the Hippodrome on 17 May, previewing material from their new record Compared to What to be released in September. 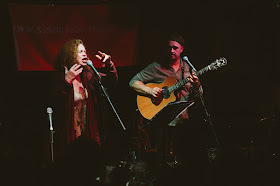 From their opener, Awestruck (described by Sarah as “about a friend who’s fallen in love with every male that she sees”) the room was enthralled by Sarah’s expressive, earthy vocals & Antonio’s mastery of the guitar. Using every facet of the instrument, he conjured up a full and expressive accompaniment, from groove-based walking lines to picked staccato notes, harmonics and percussive sounds from the body of the guitar itself. Their second song, “Comfort Zone” was particularly compelling, anchored around a haunting chord sequence that winnowed its way into the core of the audience, matched by lyrics such as “lonely shapes they shiver & wait” which provided a fitting backdrop to the purpose of the evening. Two other songs – an innovative reimagining of Dylan’s “Blowing in the Wind” and another original, “The Sea” – brought the first set to a powerful close. The night’s special guest, Tanita Tikaram, became a household name in the late 1980’s off the back of her multi-million selling debut album, Ancient Heart & its singles, Twist in My Sobriety and Tanita’s first song of her 606 performance, Good Tradition (supported by bandmates Oliver Darling (guitar) & Martin Winning (saxophone), with contributions from Ian on piano). 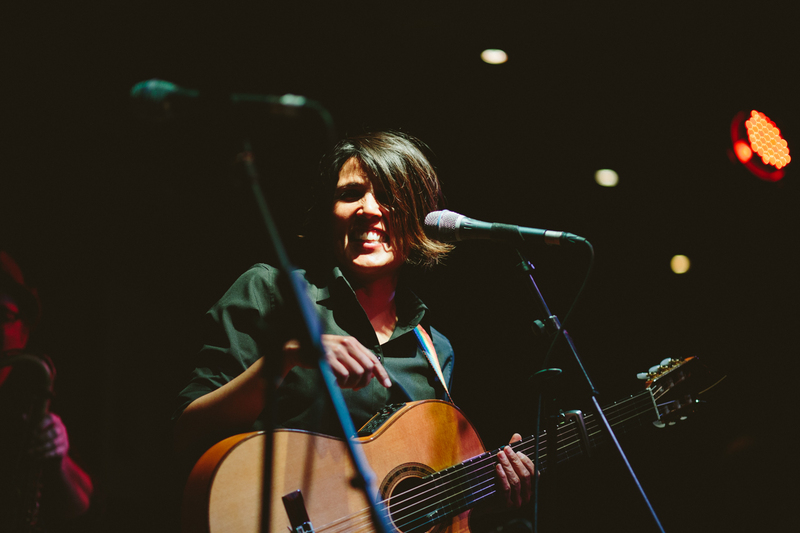 The second song, Food On My Table from Tanita’s just-released album, “Closer to the People” is a slow, rolling R&B lament urged on by saxophone swells and the lyric, “I’ve been played for a fool over town”. My Enemy also from the new record, verged into the realm of classical music with its chordal structure, played simply & delicately by Tanita at the piano. She thanked Ian, and finished with another familiar tune, Cathedral Song. Ian returned to the stage to speak passionately about the crisis in Calais before performing My Brother, alluding to all the people he has met from Eritrea, Syria, Sudan and elsewhere through his volunteer work. A born raconteur, Ian’s anecdotes, whether talking about the situation on the ground in France, his thoughts about the government’s policies or Sammi’s, the restaurant in the Calais camp that became a community hub, were as sweary and hilarious as they were affecting. By way of an encore, we were treated to two special guests, singer Tiny May who performed a gorgeous rendition of For All We Know accompanied by Ian with great flourish, and Georgia Mancio, who performed “Where is Love” from Lionel Bart's Oliver. A worthwhile event,and a night to remember, and to be thankful for.